In this Romantic Comedy ‘Bride Wars’, and it is a Romantic Comedy despite the fact that the two romantic leads are both straight women, a pair of best friends have a rather severe falling out and then of course get back together. But women out there, does this really happen? From my limited experience I’ve seen women who have been friends for life, blood sisters even, have fallings out way milder than what Kate Hudson and Anne Hathaway did to each other in this movie, and to a girl neither of them have spoken to each other to this very day. Some of these observed grudges are lasting upwards to twenty years or so. Hell, the dude at work informed us that his 82 year old mother hasn't spoken to her sister in over sixty years. Contrast this to how men relate to each other for instance, because in the morning your best friend might shoot you in the shoulder in a fit of rage, but after putting a band aid on that bullet wound we’ll be enjoying shots of Hennessey and watching the game later that night. These are generalizations of course but I have yet to see a pair of women have a knock down drag out and then eventually kiss and make up. As little girls Liv (Hudson) and Emma (Hathaway) made a pact that they would marry in June at the some place called the Palladium or the Enchanted Room or the Palace or someplace that I can’t rightfully remember. Twenty years or so later, as our narrative guide Marion St. Claire (Candice Bergin) would inform us, the girls have grown into vibrant women and inseparable friends as Liv is a high powered attorney and Emma makes a living as the worlds hottest elementary school teacher. Both women still hold out that dream of a June wedding at the Enchanted Joint, with the only hold up being a proposal. proposed to by her man Daniel (Steve Howey). I should also mention that floating around in this movie is Liv’s sweet and handsome brother Nate (Bryan Greenberg). When the character of Nate first introduced himself I figured he must be the funny gay guy that these movies tend insert within the narrative for more comic hilarity. As it turns out Nate wasn’t gay or funny which made his purpose in this movie fairly clear, unless ‘Bride Wars’ surprises us and ignores this obviously ‘telegraphed plot device’. I’m not holding my breath. Anyway to jump to the quick, the best friends weddings are accidentally booked on the same day and at the same place that they have dreamed of which makes lifelong friends bitter enemies, and as such they end up doing things to each other that quite honestly stopped being funny kind of quick. One of the things we’re asked to believe, on our road to hatred and destruction, is that Kate Hudson used to be fat. Being as Kate Hudson looks like she weighs a robust four pounds and probably enjoys a diet that consists of sautéed oxygen, that seems unlikely to me. It is a lovely four pounds though. Miss Hathaway on the other hand looks like a girl who might enjoy a steak and a potato once every two months. So the bitterness, hatred, hostility and cruel acts continue until the fateful day where everything comes to a head, with our hope being that these two lifelong friends will find the love again. Sometimes friends, you find yourself in the theater and seriously question why you are there. Surely this movie ‘Bride Wars’ deserves better representation than an overweight, beer drinking, football loving male such as myself can give a movie about two chicks getting married, particularly when this males favorite scene in the movie was watching Anne Hathaway on the strippers stage dressed in a slutty cops uniform doing the nasty dance and swinging on a rope. The girl can get down a little bit though. I was impressed. I don’t know if she can get down like I can get down because back in day baby… but I digress. Yes ‘Bride Wars’ probably deserves better than what I can give it but this is what it gets. ‘Bride Wars’ suffers from a number of maladies, for as a Romantic Comedy it deviates not one single bit from normal RomCom convention. Everything follows along just as you would expect it to as there are no surprises, no originality, no suspense, no nothing that you haven’t seen before and before and before. I will admit though that the movie did make me laugh on more than one occasion and Hudson and Hathaway are a pair of magnetic and talented actresses, but it’s not long into the movie that the laughter stops and the cruelty begins and it almost becomes uncomfortable to watch. Then after all this cruelty stops the movie just kinds of ends with them being best friends again. I know that’s a spoiler and all but I’m thinking you probably knew that already, and if you didn’t know that they were going to kiss and make up, for you I am now falling on the sword. Truthfully I don’t how anybody can reconcile what these two were doing to each other, much less after an eye gouging, wedding destroying fist fight followed by thirty seconds of deeply felt dialog. But I guess that could happen, you know? 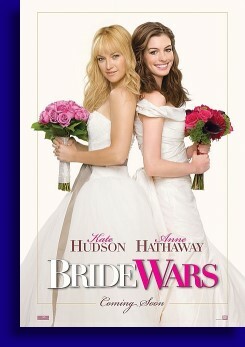 For a little while ‘Bride Wars’ was actually palatable. But only for a little while. The rest of the movie was predictable, mean spirited nonsense, ending with forced sentimentality. But it did have Anne Hathaway swinging on a rope in a slutty cops uniform. Just throwing that out there.